Hi-Fi News are one of the leading hi-fi magazines, offering the latest in product news, reviews and all things hi-fi. 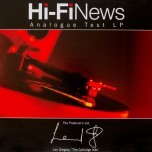 The Hi-Fi News Test LP is a superb setup tool for turntables, channeling Hi-Fi News experience into one superb product. In total, there are now seventeen tracks. Side one covers channel identification and phasing, pink noise, and bias settings (Four tracks at increasing amplitudes). Side two contains tracking ability bands at the outside, middle and inside of the disc, cartridge/arm resonance and alignment tests, full frequency (20Hz-20Khz) test and a residual noise test. All bands are separated by locked grooves.